Reference number for this case: Jour-Mois-54-Montrollet. Thank you for including this reference number in any correspondence with me regarding this case. Around 6 o'clock in the morning, Mr. Pierre Lucas, a baker in Loctudy (the Finistère), who was busy getting water from the bakery yard, suddenly saw in the night a machine in the shape of a saucer of 2 m. 50 to 3 meters in diameter. He saw an individual measuring about 1 m. 20 who approached him and patted him on the shoulder, uttering unintelligible words. The bakery workman managed to keep his cool and went back to the bakery where the stranger followed him. In the light, Mr. Lucas was able to stare at the visitor. His face was oval, covered with hair and eyes the size of a raven's egg. The young man called his boss, but before the latter had time to come down, the nocturnal unknown had disappeared as well as his saucer of which no trace was found. A beer-dealer of Concarneau, for his part, stated that he had seen in the sky two luminous disks of the form of round tables extended with a kind of tail. One of the discs was motionless while the other was maneuvering nearby. The two discs disappeared after 10 minutes after launching a rocket. In Beaulieu, the Corrèze, a mysterious machine was seen Monday by several people worthy of faith. 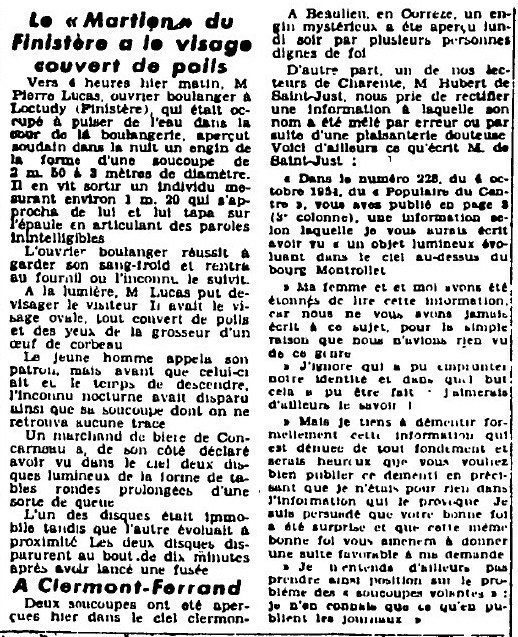 "In the issue 228 for October 6th, 1954, of the" Populaire du Centre", you published on page 3 (5th column) an information according to which I would have written to you to have seen a "luminous object" evolving in the sky above the Montrollet village. "My wife and I were amazed to read this information because we never wrote to you about this, for the simple reason that we did not see anything like that. "I do not know who borrowed our identities and for what purpose this was done - I would like to know! "But I want to formally deny this information which is totally unfounded and would be glad that you would publish this denial, stating that I had nothing to do with the information that provoked it. I am persuaded that your good faith was abused and that this same good faith will lead you to give a favorable result to my request. "I do not mean to take a position on the problem of the "flying saucers": I know only what the newspapers publish. [---] Article in the regional newspaper , France, page 3, October 6, 1954. [pc1] Article in the regional newspaper , France, October 7, 1954.